With the built-in Promethean Pagination Thumbnail Browser, you can quickly and efficiently find, organize and preview pictures. 1.Click to toggle to picture browser. 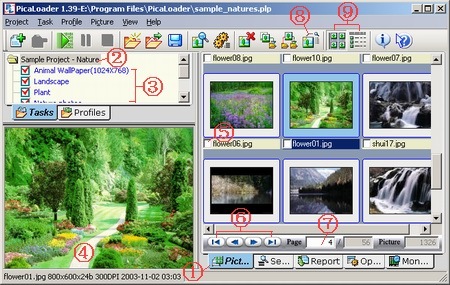 2.The task tree's root, click to select it, the browser will display all pictures of this project. 3.Click a task to select it, the browser will only display pictures belong to this task. 4.Preview pane, double click it to see picture in full screen mode. 5.Picture check box, click to check/uncheck a picture, you can click to check any number of pictures for delete, search, copy, move, etc. 6.Navigator bar, click to change current page to first page, previous page, next page, last page. 7.Input a page number and press Enter to change to that page. 8.Click to see selected pictures properties. 9.Change between thumbnail mode and detail mode. 1.Click to toggle to detail mode. 2.Click to check all pictures of current page. 3.Column head, click to sort by this column. 4.Current sort column, click to toggle sort order. 5.Picture's original web page, click to open with Internet Explorer. 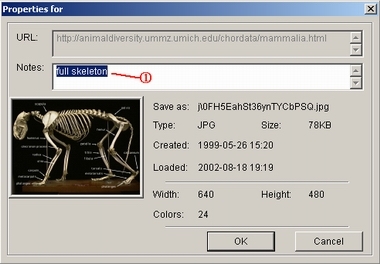 1.The picture's notes, it is auto retrieved by PicaLoader, but you can modify it at here then click OK to saving to project database.